Fix won't break your budget. Fixate on this: a boutique in trendy Fulton Market district that swarms with a perfect mix of established designers and up and coming clothing makers. 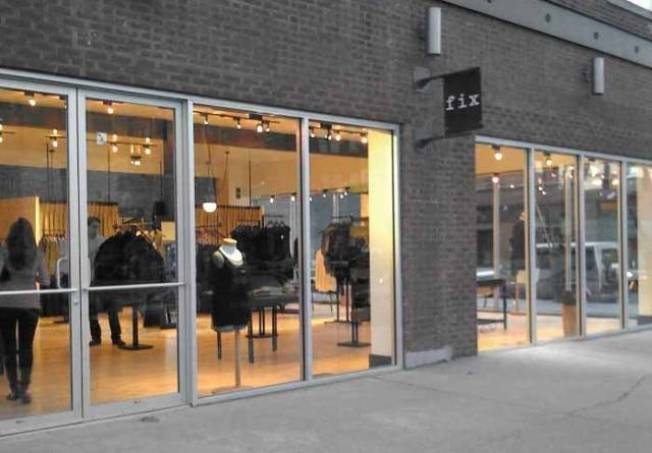 Find all of this and more at the newly opened Fix Boutique. Founders Maggie and Jennifer Gelber, two sisters from the northern suburbs of Chicago, turned their love for piecing together the perfect, New York street style-influenced outfit, into a career; and now a store. Inside the lofty, open boutique you’ll find men’s and women’s pieces like Splendid tees and Vince softer-than-soft sweaters, as well as trendy lines Black Halo, Rich & Skinny, Elizabeth and James (the Olsen Twins’ line) and so much more. The Gelber sisters are all about mixing new-comer lines with established designers, giving the boutique an organic mix of fashion inside and out. And it’s not just the clothes that will make your heart go pitter-patter. The bottom level of the store is equipped with a VIP dressing room (which was created for those loyal regulars) and a wet bar if you’re in desperate need of a little cocktail. Clothing and cocktails. Whatta great fix.